In this article, we are going to create a really simple application using ASP.NET Core MVC to get more familiar with this technology. 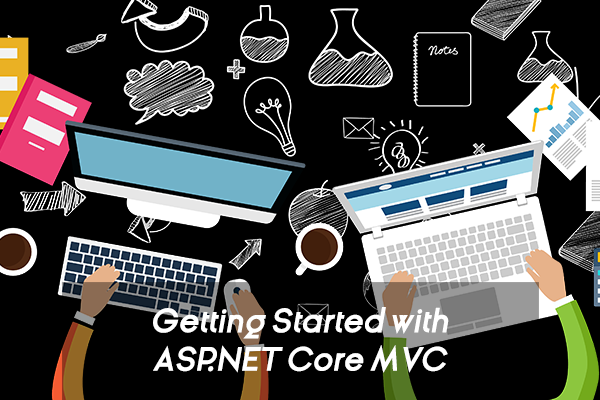 Through this post, we are going to build a really simple application using the ASP.NET Core MVC technology. It is going to be pretty straightforward and this will allow us to have a brief overview of this tool. Here, we are going to use the second version of ASP.NET Core. ASP.NET Core is an open-source software created by Microsoft. It allows us to develop web apps, services, IoT apps or mobile backends. The main difference with ASP.NET is ASP.NET Core is cross-platform. By the way, it lets us to run on .NET Core or .NET Framework. The Model represents the data business logic layer. The Business Logic should be encapsulated in the model, along with any implementation logic for persisting the state of the application. Views are responsible for presenting content through the user interface. There should be minimal logic within a View and this logic should be related to presenting content. A Controller is a component that handles and responds to user input and interaction. It renders the appropriate View with the Model data as a response. So, it is responsible for selecting which Model type to work with and which View to render. We can also create our project inside Visual Studio (“New > Project > Visual C# > .NET Core > ASP.NET Core Web Application”, then select “Web Application (Model-View-Controller)”). This will generate a Solution and the project itself. Now that we created our application, let’s take a look at the structure of our folder. We can also hit “F5”, or click the “play” button in Visual Studio and wait a few seconds. Our project will be available at “http://localhost:RANDOM-PORT“. For our project, we are going to use the Entity Framework Core. Entity Framework Core is an object-relational mapper (ORM) that allows us to work with a database using .NET objects. It supports a development paradigm called Code First. It lets us create Model objects by writing simple classes (also known as POCO classes, from “plain-old CLR objects”). We can have the database created on the fly from our classes. Here we create only one “DbSet” property. A “DbSet” corresponds to a database table and an Entity corresponds to a row in the table. Here, we register our context for Dependency Injection. LocalDB is a lightweight version of the SQL Server Express Database Engine. LocalDB runs in a special execution mode of SQL Server Express that allows us to work with databases as “.mdf” files. LocalDB is installed by default with Visual Studio. In a real application, our data model will change frequently. So, for each change, we need to sync that database. We could configure the Entity Framework Core to automatically drop and re-create the database each time we change the data model. This is alright for development, but not for production because we would lose data. To solve this problem, we need to use the Code First Migrations feature. We can use the Server Explorer to see that our migration has been run. Now, the first time we run the application, the database will be seeded with test data. Now, we are going to create our “GamesController”. To achieve this, we are going to use the “scaffold” option, so we need Visual Studio and it is required that our project is embedded in a Solution. So, we can right click on the “Controllers” folder and select “ MVC controller with views, using Entity Framework”. Let’s name our Controller “Games”. For the Model class, we can select “Game” and for the Context “GameContext”. We can also choose to use shared view “_Layout.cshtml”. After a few seconds, we can see that a Controller with some code in it and a bunch of Views have been created for us. It is time to run our application again. Let’s go to “http://localhost:RANDOM-PORT/games” to see the result. As we can see by looking at the result and the code, a lot has been made for us. Through this article, we got an overview of the ASP.NET Core MVC Framework. We saw the basic concepts it uses. We built a small application using the MVCpattern and saw the different options that we have to create a dynamic web application. We saw how to create basic Models, Views and Controllers. We had a brief overview of the Entity Framework and how to use it. We are now ready to get further, because, of course, here, we didn’t talk about production environment or other elements. WindowsHostingLeader.com is a professional web hosting review website to help people find the best web hosting at the lowest price available. We receive compensation from the web hosting companies whose products we review. But we test each product thoroughly and give high marks to only the very best. This is the principle we follow on ranking top 3 ASP.NET hosting.